I have a calf strain, a sharp twinge that occurred when I was playing soccer about a week ago. It’s prevented me from running. I can only go about a mile before the twinge forces me to stop and walk. The only remedy for this pain is time. Instead of running after work, I had to come up with a new activity. I decided to do evening walkabouts, ambulatory strolls around downtown Washington. I started last night, just as the rain was tapering off. My destination: the White House. 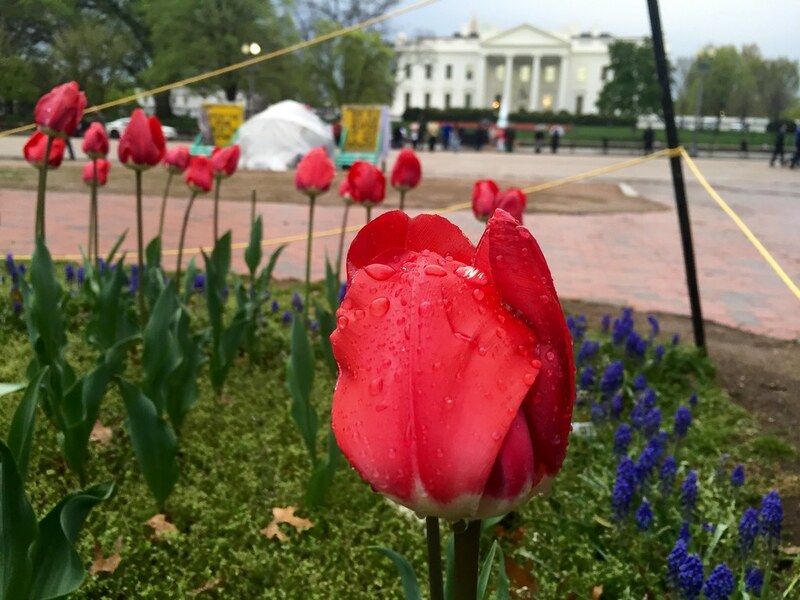 There I discovered tulips, their petals closed up and sparkling with rain drops. 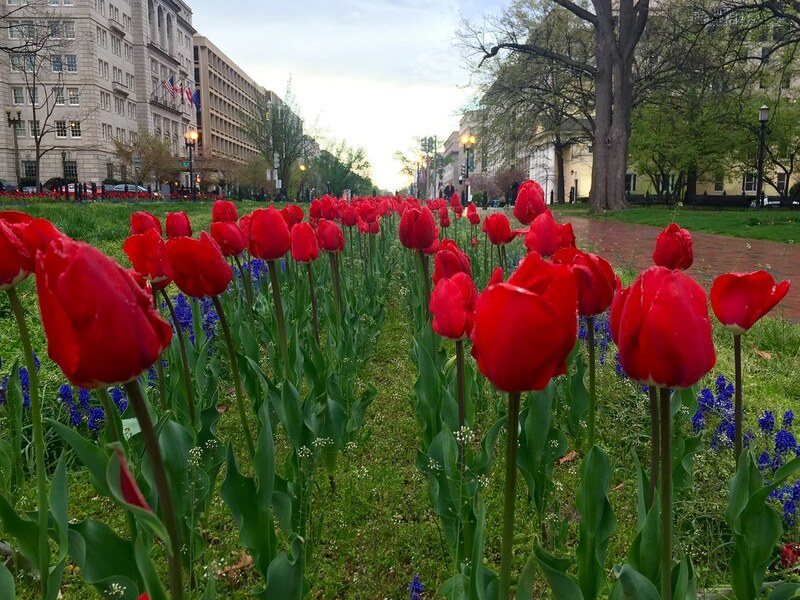 After taking some tulip pics, I headed for Farragut Square. The rain had stopped and the clouds had cleared in the west. Suddenly, the streets were suffused with a warm, golden light. 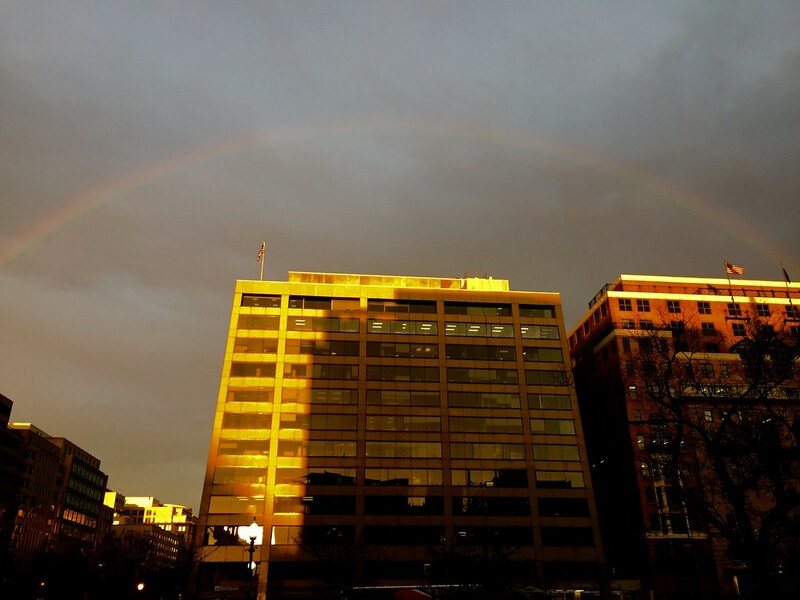 And then, in the sky over the office buildings, a rainbow appeared – a good luck sign, blessing the idea of evening walkabouts. 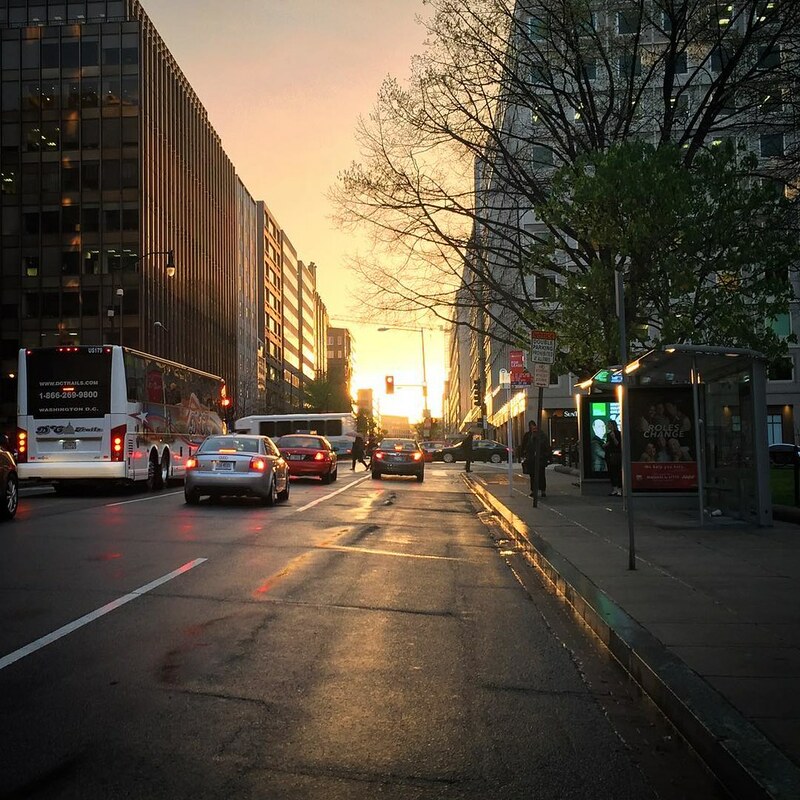 I continued my way up Connecticut Avenue to Dupont Circle. It’s a destination that I’m drawn to again and again. 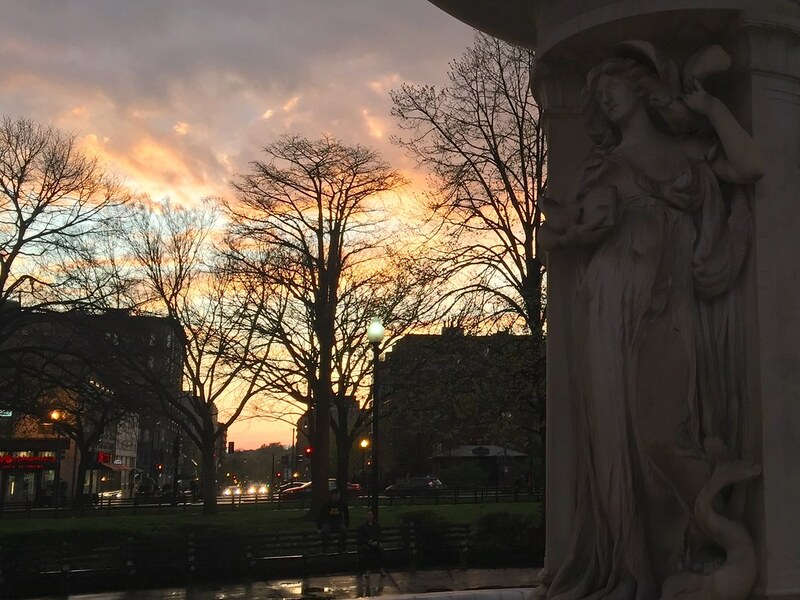 Not only is it a pretty spot, but it represents something to me – it’s where I first got a taste of urban life after coming to DC for college. It was where we went to eat Greek food at Zorba’s (still there) and drink in local bars (most of which are gone or changed names). The sun was just beginning to set as I arrived. Listening to the Pixies, I headed east on Q St. There was one more destination I wanted to check out: the Barbie Pond Garden. This is a local institution that I have somehow missed. 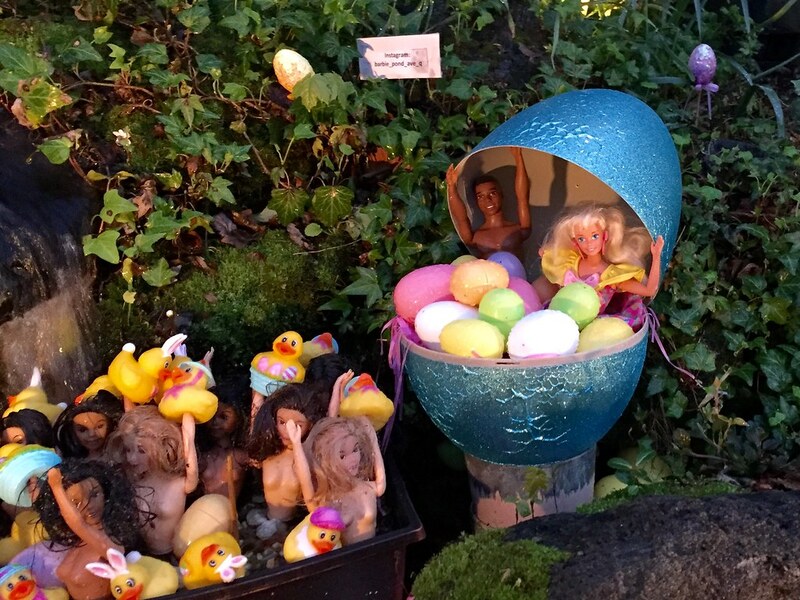 The owners of this house at 15th and Q decorate their garden with naked Barbies. This month’s theme was Easter. It’s going to be a while before I can run again. The only remedy for pain is time. Instead of running, I’m going to walk in different directions – north, south, east, west – and write and take photos of what I discover in DC.